Oral reconstruction and rehabilitation using dental implants in patients with partial and complete edentulism has become extremely common in clinical practice. At the same time, patient expectations about the outcomes of implant therapy have also risen. Deeb et al1 report that 49% of patients who had a consultation expected dental implants to last more than 20 years. While high implant success and survival rates have been reported, the prevalence of peri-implantitis was reported to range from 1% to 47%.2,3 In addition, the progression of peri-implantitis follows a nonlinear, accelerating pattern, and the onset of bone loss was usually within three years of function among the affected implants.4 Accordingly, clinicians need to realize there is a wide gap between patient expectations and epidemiologic data. In light of the fact that more than 50% of patients say a dentist is their most significant source of information on implants, clinicians need to present realistic outcomes of implant-supported restorative therapy.1 Therefore, recognizing risk factors, developing a proper treatment plan, and providing adequate maintenance care at general dental offices are necessary to minimize complications and improve outcomes. Toward this goal, this article will review the risks of implant complications and how operators can prevent adverse events. Because most implant complications are multifactorial, it is difficult to identify one specific factor in the clinical setting that can lead to implant failure. Thus, the treatment plan for dental implants must be comprehensive and include a multidisciplinary approach. Each clinician must obtain a complete medical history, followed by extraoral and intraoral examinations — including the assessment of the periodontal and periapical status of existing teeth. 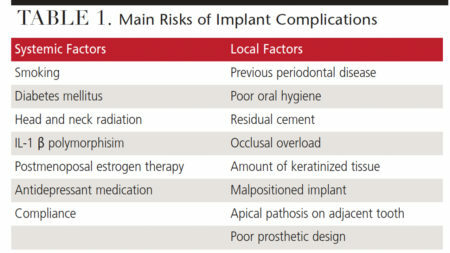 Risk of implant failure can be classified into two main groups: systemic conditions and local factors (Table 1).5–7 The diagnosis phase helps clinicians and patients identify many preexisting determinants that could negatively affect the outcome. If any potential causative factors affecting long-term implant success are recognized at this phase, further investigation and discussion of each risk factor is needed. FIGURES 1A and 1B. Extraction plan (A) and diagnostic wax-up (B). Prior to implant placement, all presenting intraoral pathologic conditions should be treated. These include the management of periodontal disease, endodontic lesions and caries. Patient compliance with plaque control should be monitored during the initial phase before moving to implant therapy. Once any inflammatory disease has been addressed, an individualized restorative treatment plan should be developed. Three-dimensional radiographic evaluation using cone beam computed topography with a radiographic marker, along with a diagnostic wax-up, are essential steps in this process (Figures 1A and 1B). These three-dimensional images allow clinicians to assess vital anatomical structures, such as the inferior alveolar nerve, mental foramen, lingual concavity of the posterior mandible, incisive canal, shape and pathological changes of the maxillary sinus, and the endodontic status of adjacent teeth. Implant simulation software is used to evaluate the local anatomical structures and improve clinicians’ understanding of possible future implant positions (Figures 2A through 2C). FIGURES 2A through 2C. Implant site analysis with cone beam computed tomography. In Case 1 (Figures 3A and 3B and Figure 4), the surgeon accurately predicted the alveolar ridge width was inadequate for implant placement based on the restorative plan, and that simultaneous bone augmentation was needed at the time of implant placement. Following an appropriate healing period, provisional and definitive restorations were delivered (Figure 5). Envisioning the outcome before treatment is provided — referred to as “top down” treatment planning — is vital to the success of therapy. Malpositioned implants, especially those placed too buccally, might have higher susceptibility for peri-implant complications. Monje et al8 found in his survey study that most of the experienced implantologists agreed that prevalence of peri-implantitis was higher in malpositioned implants. However, more control studies are needed to confirm this outcome. Good communication and a team approach are necessary to achieve functional and esthetic outcomes in implant dentistry. FIGURES 3A and 3B. 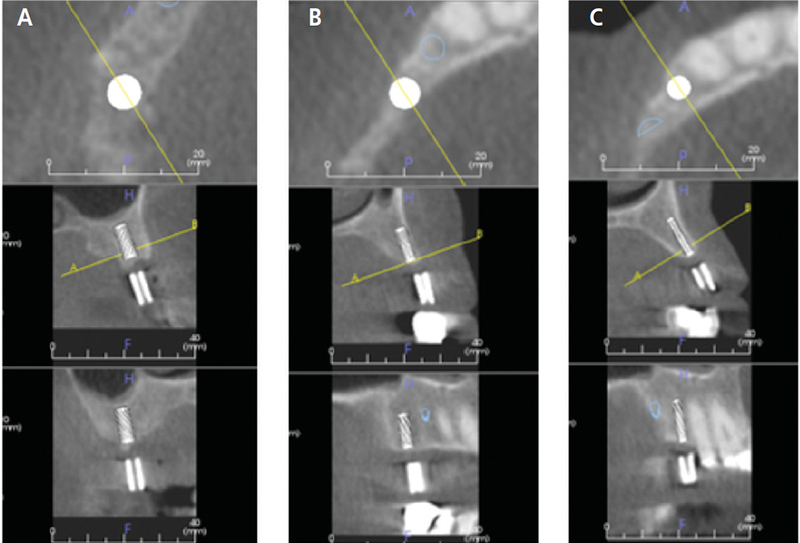 Implant placement (A) and simultaneous bone augmentation (B). Both screw- and cement-retained prosthesis are acceptable treatment options for single and multiple fixed implant restorations. However, there is debate over which is the better connection in the long term. 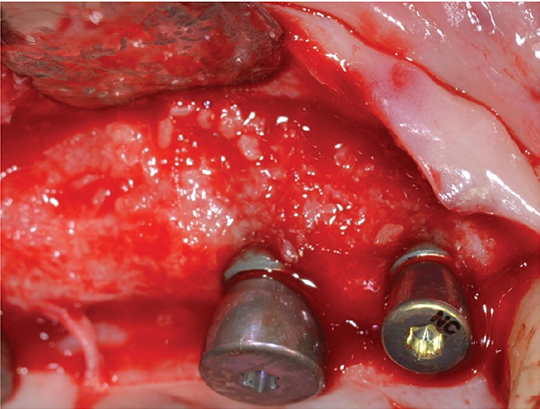 A cement-retained connection has several advantages over a screw-retained prosthesis in terms of cost, ease of fabrication, lack of an access hole (advantageous for a narrow-diameter implant with limited restorative space), and ability to change the angulation of the implant axis by utilizing angled abutments.9,10 A systematic review by Wittneben et al11 compared cement- and screw-retained implant-supported restorations. The 5-year cumulative survival rate of cement-retained reconstruction was 96.03%, while it was 95.55% for screw-retained prostheses. There was no statistically significant difference between the two groups. However, this study revealed that screw-retained fixed prosthesis exhibited a slightly lower biological complication rate, such as the presence of fistula/suppuration rates. In addition, the major negative aspect of cement retention is the presence of residual cement following delivery of the prosthesis that can lead to peri-implant mucositis and peri-implantitis. A clinical trial has shown that approximately 80% of the cement-retained implant prostheses with radiological and clinical signs of peri-implant disease had subgingival residual cement retention.12 Thus, it was concluded that residual cement might play an important role as a bacterial reservoir, leading to soft tissue irritation that contributes to peri-implant tissue breakdown. FIGURE 4. Augmented bone was found on the buccal side of implants. In Case 2 (Figures 6A and 6B), the patient presented to a graduate clinic with 5- to 7-mm probing depths and bleeding on probing around implant #8. Clinically, tissue inflammation was noted on the gingival margin of #8. Upon examination, residual cement was noted in the subgingival area. This represents the obvious etiologic factor for iatrogenic peri-implant disease (Figure 7). To reduce complications associated with the presence of residual cement, it has been recommended that, whenever possible, clinicians should consider using screw retention as the connection of choice.10 Linkevicius13 investigated the relationship between crown margin position and undetected residual cement. This study revealed that more remnant cement was found on sites with a deeper subgingival margin area. In addition, the majority of excess cement was not found with radiographic examination. If implant position is compromised and a screw-retained connection cannot be used, utilizing a custom abutment to place the crown margin < 2 mm submarginally is recommended. FIGURES 6A and 6B. 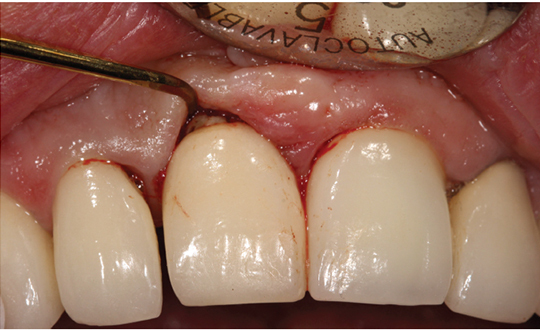 Marginal gingival inflammation (A) and bone loss (B) on implant #8. Peri-implant mucositis and peri-implantitis are often associated with an inflammatory reaction to bacterial invasion within the peri-implant tissue. The first signs of peri-implant mucositis include bleeding on probing and/or suppuration, increased probing depth, redness and swelling. These signs are recognizable upon careful clinical examination.6 The main purpose of the maintenance protocol for patients with implant-supported restorations is to prevent the onset of inflammatory disease, and, if applicable, halt the progression from peri-implant mucositis to peri-implantitis. This is key, as there are no predictable and reliable methods to treat peri-implantitis. Costa el al14 showed that subjects who lacked monitoring of the peri-implant tissues and preventive maintenance were associated with a higher prevalence of peri-implantitis than patients who underwent maintenance therapy. FIGURE 7. Residual excess cement on implant #8. Supportive periodontal and implant maintenance has even more value if patients have history of periodontitis. Roccuzo et al15 conducted a prospective study to evaluate the long-term results of implant therapy in patients with periodontitis. This study revealed that patients with a history of periodontitis have a higher incidence of implant loss and peri-implant disease. In addition, patients with a history of periodontitis who do not follow a maintenance schedule experience a significantly higher rate of implant failures. 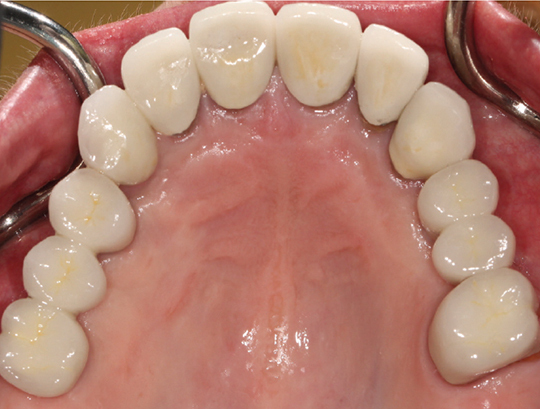 Patients with implant-supported restorations clearly should have regular maintenance visits. At each appointment, a comprehensive evaluation should include reviewing the medical history, followed by updating periodontal and peri-implant charting, evaluating oral hygiene, and assessing occlusion. Because poor oral hygiene is a risk factor for peri-implant disease (Figure 8), emphasizing the importance of optimal self-care, along with patient education, should be a part of the maintenance visit. FIGURE 8. Plaque accumulation around implants associated with bone loss. The incidence of complications arising with implant-supported restorations is minimized with proper selection of implant patients, risk assessment, careful treatment planning (using a multidisciplinary approach), and individualized, long-term maintenance care. Although implant complications are not entirely avoidable, the long-term success of this treatment option is enhanced by regularly monitoring the health of peri-implant tissues, both clinically and radiographically. Recognizing risk factors for peri-implant disease, developing a proper treatment plan, and providing adequate maintenance care at general dental offices can minimize implant complications and help improve outcomes. Because most implant complications are multifactorial, it is difficult to identify one specific factor that can lead to implant failure. Peri-implant mucositis and peri-implantitis are often associated with an inflammatory reaction to bacterial invasion within the peri-implant tissue. The main purpose of the maintenance protocol for patients with implant-supported restorations is to prevent the onset of inflammatory disease, and, if applicable, prevent the progression from peri-implant mucositis to peri-implantitis. The first signs of peri-implant mucositis include bleeding on probing and/or suppuration, increased probing depth, redness and swelling. Maintenance treatment and recare intervals should be individualized according to each patient’s systemic and local risk factors. Deeb G, Wheeler, B, Jones M, Carrico C, Laskin D, Deeb JG. Public and patient knowledge about dental implants. J Oral Maxillofac Surg. 2017;75:1387–1391. Derks J, Tomasi C. Peri-implant health and disease. A systematic review of current epidemiology. J Clin Periodontol. 2015;42 (Suppl 16):S158–S171. Buser D, Janner S, Wittneben JG, Brägger U, Ramseier CA, Salvi GE. 10-year survival and success rates of 511 titanium implants with a sandblasted and acid-etched surface: a retrospective study in 303 partially edentulous patients. Clin Implant Dent Relat Res. 2012;14:839–851. Derks J, Schaller D, Håkansson J, Wennström JL,Tomasi C, Berglundhl T. Peri-implantitis — onset and pattern of progression. J Clin Periodontol. 2016;43:383–388. Moy PK, Medina D, Shetty V, Aghaloo TL. Dental implant failure rates and associated risk factors. Int J Oral Maxillofac Implants. 2005;20:569–577. Peri-implant mucositis and peri-implantitis: a current understanding of their diagnoses and clinical implications. J Periodontol. 2013;84:436–443. Renvert S, Quirynen M. Risk indicators for peri-implantitis. A narrative review. Clin Oral Implants Res. 2015;26 (Suppl 11):15–44. Monje A, Galindo-Moreno P, Tözüm TF, Suárez-López del Amo F, Wang HL. Into the paradigm of local factors as contributors for peri-implant disease: short communication. Int J Oral Maxillofac Implants. 2016;31:288–292. Wittneben JG, Joda T, Weber HP, Brägger U. Screw retained vs. cement retained implant-supported fixed dental prosthesis. Periodontol 2000. 2017;73:141–151. Wittneben JG, Millen C, Brägger U. Clinical performance of screw- versus cement-retained fixed implant-supported reconstructions — a systematic review. Int J Oral Maxillofac Implants. 2014;29 (Suppl):84–98. Linkevicius T, Vindasiute E, Puisys A, Linkeviciene L, Maslova N, Puriene A. The influence of the cementation margin position on the amount of undetected cement. A prospective clinical study. Clin Oral Implants Res. 2013;24:71–76. Costa FO, Takenaka-Martinez S, Cota LO, Ferreira SD, Silva GL, Costa JE. 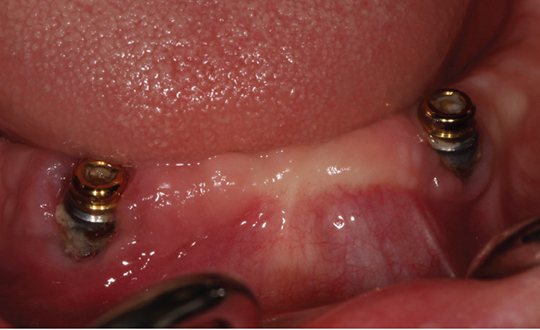 Peri-implant disease in subjects with and without preventive maintenance: a 5-year follow-up. J Clin Periodontol. 2012;39:173–181. Roccuzzo M, De Angelis N, Bonino L, Aglietta M. Ten-year results of a three-arm prospective cohort study on implants in periodontally compromised patients. Part 1: implant loss and radiographic bone loss. Clin Oral Implants Res. 2010;21:490–496. Gay IC, Tran DT, Weltman R, et al. Role of supportive maintenance therapy on implant survival: a university-based 17 year retrospective analysis. Int J Dent Hyg. 2016;14:267–271. Armitage GC, Xenoudi P. Post-treatment supportive care for the natural dentition and dental implants. Periodontol 2000. 2016;71:164–184. From Decisions in Dentistry. October 2017;3(10):14, 16–18, 21. Kelly Hill, DDS, is the chief resident in the Department of Periodontics and Allied Dental Programs at Indiana University School of Dentistry. Jennifer Chang, DDS, is a resident in the Department of Periodontics and Allied Dental Programs at Indiana University School of Dentistry.